Actually, it's not much of a question, you should definitely insulate! 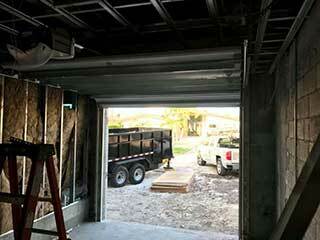 A lot of individuals do not see insulation as an important factor when it comes to maintaining their garage door. However, we always recommend buildings be well insulated for added durability and to prevent energy loss. Good insulation will save you money when it comes to heating or cooling your property. Further, when a garage door is improperly insulated or not insulated at all, there is an added risk that unwanted guests like moisture and critters will find a way in to your garage, potentially affecting the contents you have inside. When a garage is attached to a residence, it will likely share a wall with the house, and sometimes even a ceiling as well. Just as you ensure your house is insulated, you should ensure your garage is too - otherwise you're just wasting energy unnecessarily. Further, you want to ensure it's sealed to prevent the chance of fumes, exhaust and carbon monoxide entering the house. Another benefit of proper insulation is to prevent the risk of a fire spreading in the event it triggered in your garage. Just as its name suggests, these garages are completely separate from the main property. As they stand alone they will likely not share the same average temperature as your home. Even if you install an air conditioner unit inside your garage, without proper insulation, this energy is likely to escape and your bills will be higher. When it comes to harmful fumes, insulating detached garages are not as much of a priority but it is always worth considering how your door is likely to cope against the elements – you may wish to add that bit of extra protection for durability's sake. Can Any Door Be Insulated? Yes. Steel doors, wooden doors, all doors can be professionally insulated if you have the right materials. If you are about to purchase a brand new door, it is worth raising the question of insulation from the start so you don't have to worry about additional costs later on. Hopefully this post has provided you with useful information to take away and think over, but if you have further questions regarding your insulation options, don't hesitate to contact our local professionals in Duluth, Georgia – we'll be glad to hear from you any time!